Recipe submitted by Ginger Graham, President & CEO, Amylin Pharmaceuticals. Warm crescent rolls right out of the oven are one of the great joys of baking. Eat them with a meal or as a delicious appetizer. Grab one before they’re all gone at your next family gathering. 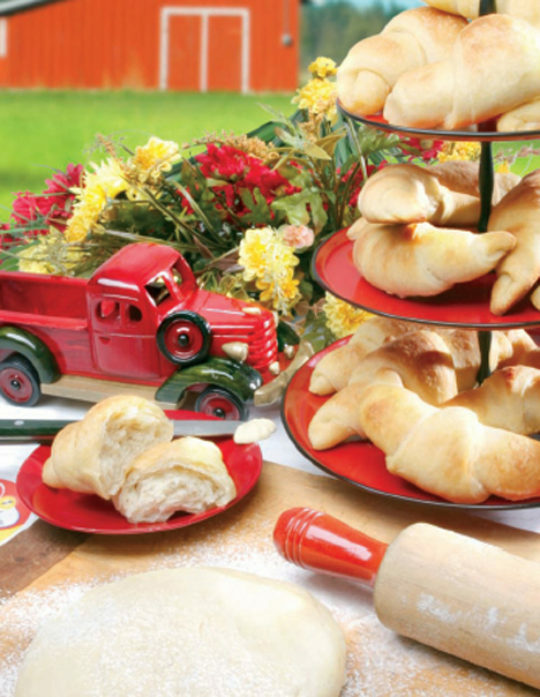 Whether it’s down on the farm or in the middle of a busy urban area, these classic crescent rolls will send your family over the moon! Mix all ingredients, cover, and let stand overnight. Next day, divide dough into quarters and roll out to 1/8-inch thickness. Cut into triangles and brush with butter. Roll up and let stand 3-5 hours on cookie sheets. Bake at 375 degrees for 8-12 minutes.